The Centre for Maritime Research and Experimentation (CMRE) is an established, world-class scientific research and experimentation facility that organizes and conducts scientific research and technology development, centred on the maritime domain, delivering innovative and field tested Science & Technology (S&T) solutions to address defence and security needs of the Alliance. The advent of quiet diesel-electric submarines operating in shallow waters poses a challenge for antisubmarine warfare. These shallow waters, known as the littoral zone, are a particularly difficult area for sonar surveillance, because of the amount of noise and reverberation found close to land. Current work at CMRE focuses largely on multistatic active sonar, a solution to finding and tracking the new generation of silent submarines. Today, sonar surveillance typically involves a ship towing an active sonar array that includes a transmitter and receiver. This approach, known as monostatic sonar, has limitations in tracking quiet submarines in shallow waters. A promising alternative to monostatic active sonar is multistatic active sonar, which involves multiple entities, or nodes, transmitting signals and receiving echoes in a coordinated effort to gain a more accurate view of the target. The nodes communicate with each other, and sophisticated signal processing software (data fusion) is used to merge the data from all of the different nodes, which can include arrays towed by ships, fixed buoys, and floating buoys. Above: Monostatic results (left) versus multistatic results (right) show the improvements in sonar data that can be gained through data fusion. The development of a multistatic system that uses both fixed sonar buoys and mobile sonar devices, including AUVs. The communications architecture that allows these devices to communicate among each other. Mine countermeasures involve finding the mine, classifying it, and destroying it so that it is no longer a threat. Currently, AUVs are being used to survey the seabed to detect mines; however, classifying the mines and destroying them still rely to a great extent on expert divers, who are placed in harm's way, and to ROVs, which are expensive if treated as an expendable device. AUVs have the potential to offer a safer, faster, and lower-cost solution for mine classification and disposal. The Centre is working to transform the way mine countermeasures are conducted from a post-Cold War approach that focuses on post-operations clearance using surface ships to a quickly deployable, autonomous system that is scalable, cost effective, and minimizes risk to personnel. 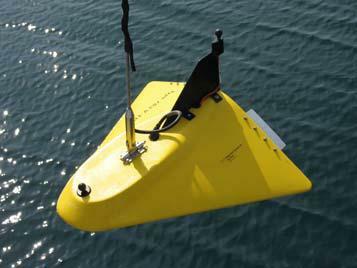 Recently, work at the Centre has focused on using AUVs for mine hunting, including developing techniques for handling the large data rates associated with modern high-resolution sonar and developing AUV systems that can make adjustments to pre-planned routes based on data that is gathered in situ. Now, the Centre's emphasis is expanding from using AUVs in mine hunting to using AUVs in mine identification and mine disposal. Mine identification. Classifying mines once they are found has historically been a time-consuming, resource-intensive process. The goal of CMRE's research is to determine the feasibility of using high-resolution sonar mounted on AUVs for mine 'super classification.' Super classification simply means that an object is quickly classified with sufficient confidence to proceed to disposal. The task involves getting multiple images, or views, of the mine, fusing those images into a single image that can then be classified with high confidence using automated techniques. Mine disposal. The emphasis in this area is on finding an autonomous and cost-effective solution. Currently, mine detonation weapons (MDWs) are typically guided to the mine by an ROV, which is often treated as being expendable despite its high cost. Self-guided MDWs exist, but they are even more costly. Emphasis is being placed on a stripped down, inexpensive MDW design that minimizes the number of sensors and processors on board while relying as much as possible on external support for guidance and control. A variety of options are being explored for transporting the MDW including AUVs, autonomous surface vehicles (ASVs), and airborne platforms (naval helicopters or unmanned air vehicles). Maritime security is a global concern. Small boats can be, and have been, used as platforms for attacks on ships in port and reported attempts at ship piracy are on the rise. Although great strides have been made in developing technologies for detecting possible attackers, more work needs to be done in developing appropriate responses once an attacker is identified. Therefore, the Centre's work in this area is currently focusing on independent testing and evaluation of nonlethal response technologies. Ports, particularly civilian ports, are difficult to protect because of the density of the port environment, the amount of traffic on sea and land, and the larger urban area where ports are typically located. The fact that attacks could come from a variety of small, hard-to-detect sources - from surface ships to SCUBA divers - also complicates the task of port protection. This complex environment makes it difficult to monitor the port for hostile intent and even more challenging to develop a response that is nonlethal to the many people who are at the port and who may live, work, and recreate in the surrounding area. A wide range of technologies are becoming available to address nonlethal responses, but there is a lack of objective analysis of these solutions. CMRE is in a unique position to analyze available solutions in an informed and unbiased approach, which will include selecting the solutions to test, developing test methodologies, conducting the tests, and providing results to NATO nations. This work builds on a previously completed project on multi-sensor harbour protection systems, which assessed the state-of-the-art technology, identified gaps in capabilities, and determined the best means to fill them. In a world where small water craft can be turned into weapons against navy destroyers and pirates can hold ships for ransom, surveillance of the sea is of increasing importance. Because surveillance resources are inadequate to monitor the world's shipping channels, tools that help maritime surveillance analysts identify suspicious activity are extremely valuable. This is why CMRE is developing the Maritime Surveillance System--a tool that NATO nations can use to select the correct suite of sensors to monitor areas of interest. The Maritime Surveillance System builds on recent work at CMRE that uses information from the Automated Identification System (AIS) and applies anomaly detection algorithms and filters to provide the NATO maritime surveillance community with information on unusual behaviour. Unusual behaviour might include unexpected ship stops or unexpected changes in course. The Maritime Surveillance System will require continued advances in anomaly detection as well as in two other areas of research: sensor performance and data fusion. Sensor performance. Currently maritime sensors include a mix of sensors, some of which work in a cooperative fashion (for example, the AIS and some of which work independently, for example, surveillance and high-frequency (HF) radar, active and passive sonar, and satellite-based EO (electro-optical) and SAR (synthetic aperture radar) imagery. The Centre is conducting a performance evaluation of all available types of sensors. Sensors are evaluated and compared based on common parameters (detection range, ROC detection performance curves, and localization accuracy) as well as parameters that are specific to the sensor technology (for example, daylight requirements for EO imagery). Data fusion. 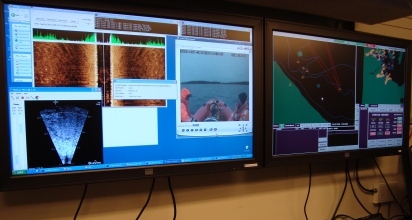 Developing a clear picture of the maritime environment requires sophisticated data processing techniques. For this task, CMRE will expand on its existing distributed multi-hypothesis tracker (DMHT). The DMHT is a high-performance, computationally-efficient set of complex algorithms (or data fusion engine) that have been used to interpret data from underwater and surface surveillance. These algorithms are being expanded in a variety of ways, including the ability to use input from multiple sensors and the ability to fill gaps in temporal or spatial data. The success of NATO forces depends on understanding the environment they are operating in and using that knowledge to make accurate decisions. In many cases, environmental knowledge is incomplete or contradictory, which can lead to poor operational and tactical decisions. CMRE is contributing to this critical area by developing a cost-effective integrated system that provides NATO militaries with the environmental knowledge they need to make informed decisions during operations. The Centre is exploiting advances in information technologies (IT) to improve the accuracy of automated decision-making tools. Likewise, we are exploring ways to improve the speed and performance and reduce costs of assessing the environment using autonomous underwater vehicles (AUV). In particular, the Centre is using gliders as a low-risk, low-cost, covert data-gathering platform. Gliders, which use shifts in mass to change their trajectory and changes in buoyancy for propulsion, can be used to gather near real-time data and can be controlled to adapt to the ever-changing requirements of the maritime environment. 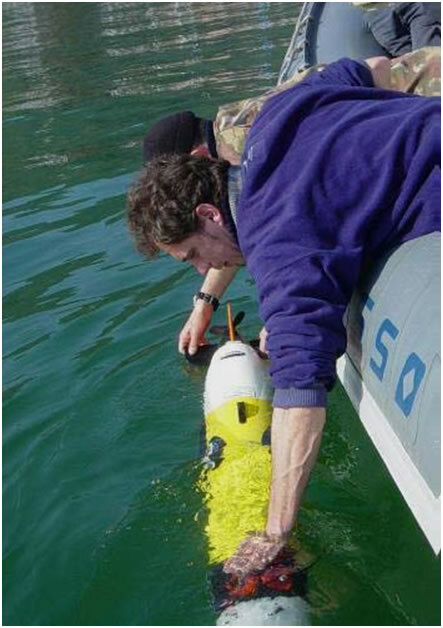 During Task 1 - environmental characterization-uncertainty is assessed using a variety of mobile and remote sensors, including satellite remote sensing andin situ sensing using AUVs. The results of Task 1 are used to improve the high-resolution models that are developed as part of Task 2. In Task 2, tactical predictions are made using a numerical forecast and the fusion of data from multiple models. 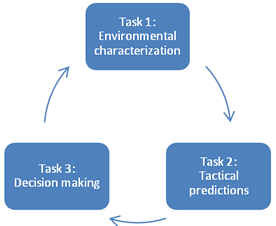 These predictions provide the inputs for Task 3, where environmental uncertainties from Tasks 1 and 2 are used by decision support software to optimize operational effectiveness and asset allocation for a given mission. These three tasks form a feedback loop when the results of Task 3 feed into Task 1: Knowledge gained as a result of decision making helps to further reduce uncertainty, ultimately increasing operational effectiveness. This broad-based project requires research in all of the core competencies at the Center, including underwater sensing, underwater networking, data collection, analysis, modeling, instrumentation, and ultimately operational analysis for NATO militaries. The Centre is continually monitoring the success of this multi-faceted program through cost, performance, and schedule metrics that are gathered during a series of ongoing sea-trials in increasingly complex marine environments. Modeling & Simulation (M&S) is one of the Critical Technologies with particular value for the NATO Nations in term of Defense, Homeland Security and Economy; in fact Simulation allow to use computer models to mime behaviors of existing real world systems, or hypothetical future systems and to carry out experiments in a virtual environment to improve understanding, performance as well as to develop new concepts and to test new technologies. M&S have a strategic relevance in several areas such as R&D (Research and Development), training, decision support, operational planning and operative support. 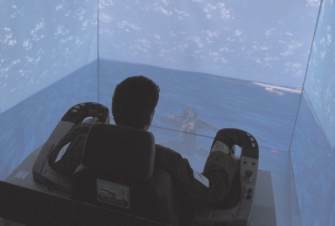 The NATO CMRE (Centre for Maritime Research and Experimentation) is active since many years in modeling the Maritime Environment and currently is developing Modeling & Simulation as a strategic asset to support its R&D Initiatives as well as to provide services, tools, models and simulators in relations to all the 5 dimensions: Sea, Air, Coast, Cyberworld and Space. CMRE currently studies innovative interoperable solutions for M&S devoted to support many different sectors (i.e. Acquisition, Analysis, Experimentation, Planning, Test and Evaluation, Training). In fact the extension of the Simulation activities at CMRE allows to extend further its leadership in Research and Experimentation in several critical areas (i.e. port protection, naval operations, mine detection, robotics) as well as to develop new solutions for emerging sectors such as homeland security, cyber defense, etc. CMRE is currently involved also in developing Serious Games such as DVx2 (Distributed Virtual Experience & Exercise). DVx2 is a virtual interactive framework enabling NATO Defense Against Terrorism (DAT) programme of work, Subject Matter Experts (SMEs) and NATO executives to demonstrate, validate, benchmark, appreciate the DAT accomplishments. DVx2 drives virtual terrorists & defenders by using intelligent agents ; this approach enables to generate tests and experience, through quick running simulated scenarios (e.g. HPP, RPGs, C-IED, CBRN, CIP, NLC, ISRTA), on improvements and challenges such as vulnerability reduction, technological and organizational advances, etc. Indeed this serious game represents the first case of using the innovative SaaS (Simulation as a Service) paradigm over NATO DNBL (Distributed Networked Battle Labs). Active sonar exercises are essential to counter the threat from quiet submarines. Because of concerns about the effects of sonar on marine mammals, CMRE is taking a proactive approach to understanding the risks and to developing mitigation measures. The outcome of this research is shared with researchers who are using active sonar as well as with the public through an interactive web site (http://solmar.nurc.nato.int). Creating accurate models. 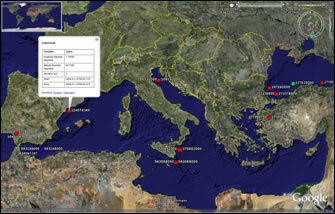 Data that has been gathered over the last decade by NATO and partnering organizations is stored in CMRE's Sighting and Stranding Database, one of the most extensive databases of this type covering the Mediterranean Sea. This database is continually being updated so that it can support the development of accurate predictive models, such as the habitat model that was recently developed for the Ligurian Sea. Developing detection technologies. 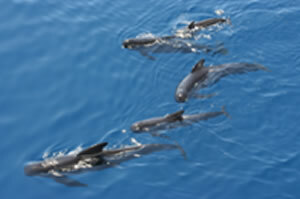 A variety of technologies have been developed for detecting the presence of marine mammals. These technologies can help inform researchers that marine mammals are in the research area. The research team can then take steps to mitigate unnecessary exposure of marine mammals to active sonar. An example of this type of detection technology is the Compact Passive Acoustic Monitor (CPAM), developed at NURC. The CPAM uses four hydrophone in a compact volumetric configuration and may be towed from a ship, but it is also suited for autonomous operation when integrated in buoys, AUVs, or gliders. Software developed for the CPAM analyzes the hydrophone data to detect, classify, and localize marine mammals in an efficient way at maximal distances. Integrating information. The research in marine mammal mitigation is culminating in an information system that gives researchers and NATO military commanders the tools they need for risk assessment and mitigation. A systems architecture is being developed that will combine all pertinent factors into a decision aid that can be used to help plan active sonar maritime activities to mitigate risk to marine mammals. Over time, this decision aid will be expanded to cover the additional NATO operational areas.